Spreadsheets are ubiquitous in the investment world. Spreadsheet software is a vital productivity tool for investment professionals worldwide. Every investment firm, regardless of size or country of origin, relies on spreadsheets for a number of tasks, including developing proprietary spreadsheet models. Although a powerful tool in the hands of investment professionals, spreadsheets come with severe risks and limitations for the organization. These include, but are not limited to; lack of security, version control and lack of governance and collaboration. SpreadsheetWEB turns proprietary spreadsheet models into secure, web-based applications, by eliminating the risks and limitations. It also empowers business analysts, instantly transforming them into application developers, by reducing and in most cases eliminating dependence on expensive IT resources. 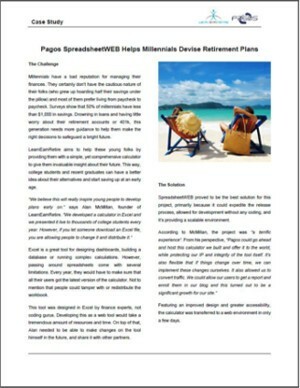 With SpreadsheetWEB, LearnEarnRetire transformed its proprietary retirement calculator into a web application and distribute it to a larger audience and feature it on partner websites as well. Users always have access to the latest version of the application with the latest payroll estimates and inflation data. One of our sales associates will contact you to learn more about your business challenges and how we can help you.